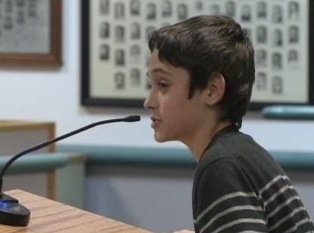 Check out this speech by 14 Year Old openly gay student Graeme Taylor. The speech is in response to the school board suspending his teacher Jay McDowell without pay, for removing a student from Graeme's class wearing a white supremisist flag for making homophobic remarks. I wish I had his self confidence and conviction at fourteen! Mature, sure of who he is, no signs of self hate and articulate to the point he is commanding the respect of every adult in the room. Inspiring although sadly his appeal on his teacher's behalf was rejected.